Open the File > Open menu or press the Ctrl+O shortcut. Then browse for a PDF file you need in the open dialog and open it. Click the Open File toolbar button. Drag-and-drop a PDF file from another application to Master PDF Editor. 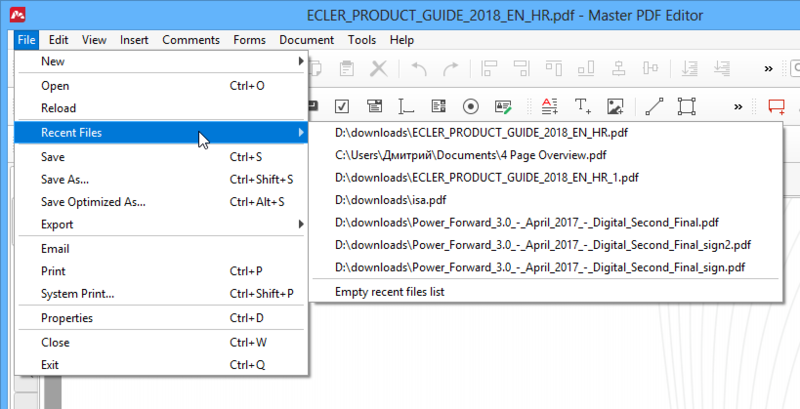 Right-click a PDF file in any Explorer window to open the context menu and select Open with Master PDF Editor item. You can also open PDF files saved from the Internet or local network or received by e-mail. When Master PDF Editor starts, select one of recently opened file on the Start page. Select the File > Recent Files menu and click a recently opened file there. 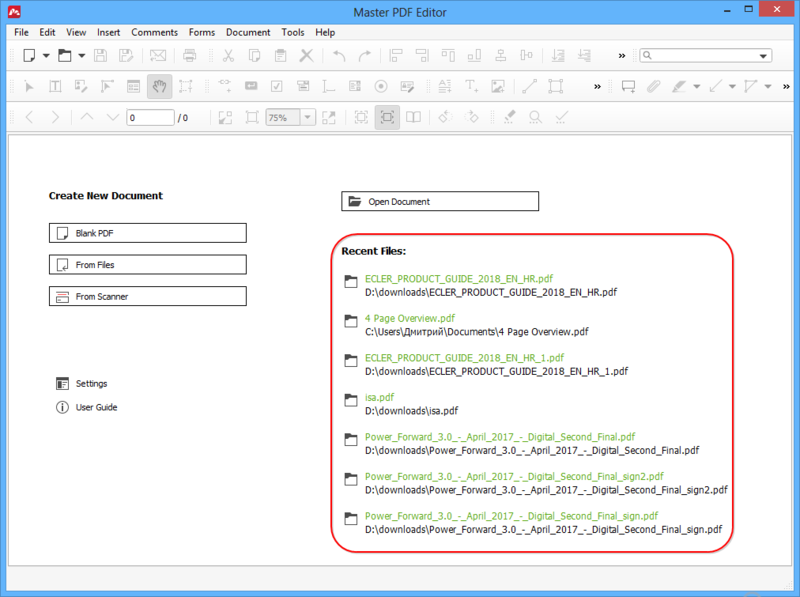 NOTE: Master PDF Editor is fully compatible with the PDF specification 1.7 and also supports files with dynamic XFA forms, which allows the application to open and view any files created in other PDF editors. Also, the owner of the document can restrict certain operations over the PDF file: printing, editing etc. To unlock these operations you need to open the Password Security window and enter the correct permission password. Open the File menu and select Save or press the Ctrl+S hotkey. This will save the modified document under the same file name. Open the File menu and select Save As or press the Ctrl+Shift+S hotkey. This will save the modified document as a new PDF file. Click the Save or Save as toolbar buttons. NOTE: Saving a digitally signed PDF file renders the digital signature invalid. You can read more about digital signatures here. Optimization of a PDF document reduces its size by removing unused elements and compressing images and forms. You can read more about optimization here. Select the File > Save Optimized As menu item to save the optimized file under a different file name. You can export a PDF document to a collection of JPEG, TIFF, BMP or PNG images. Read more about exporting to images here. Select the File > Export > Pages to Images menu item to export the PDF document to images. Specify the file name of the text file to save all texts from the PDF document to. 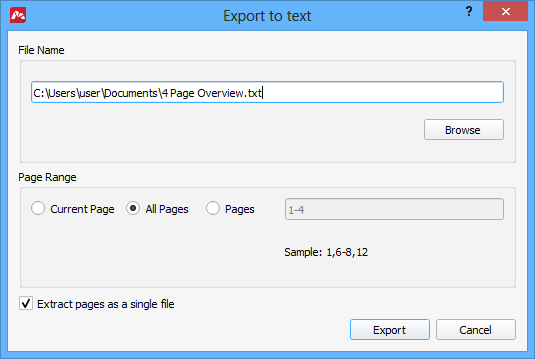 You can export all pages into the same text file or save each page of the document into a separate .txt file. The Page Range option allows you to limit the scope of pages to export.